Posted on October 4, 2017 at 10:40 pm. Play the slots on your work break? Slots Million online casino has a free spins bonus which will make chowing down your sandwich at your desk worthwhile. For every deposit you make between 11am and 1pm in your timezone, Slots Million will award you with 20 free spins thanks to its Slunchbreak promo offer. Simply sign up to Slots Million, if you don’t already have an account, log in and head to the cashier. Make a deposit of at least $/€20 using an array of online casino deposits available at the site. There’s no upper limit on how much you can fund your account with – the more you deposit, the more free spins you will get. Make sure you deposit in $/€20 increments as the terms state you get 20 free spins per deposit. The free spins will be credited to your account – if you deposited $/€100 over five deposits then you will receive 100 free spins. Any winnings from the free spins are subjected to wagering requirements of 35x. 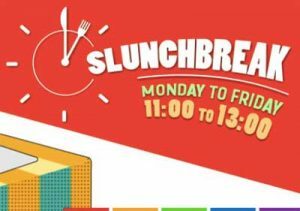 Slunchbreak runs from Monday to Friday, so if you missed out today, you can qualify tomorrow. Don’t forget, you can claim the welcome bonus of $/€100 matched by 100 percent if you a new player, too. As always, read the terms and conditions before opting into the offer. We have summarised some of the details below. Slots Million offers several online casino bonuses which all come with a 35x wagering requirement. You can clear the bonus by wagering it on the slots – other casino games are available at Slots Million but putting it through the machines clear the bonus faster. Restricted countries: Anguilla, Belgium, Bermuda, British Indian Ocean Territory, British Virgin Islands, Bulgaria, Cayman Islands, Cyprus, Denmark, Estonia, Falkland Islands, France, French Guiana, French Polynesia, French Southern Territories, Georgia, Gibraltar, Guadeloupe, Guam, Guernsey, Hungary, Isle of Man, Israel, Italy, Jersey, Martinique, Mayotte, Montserrat, New Caledonia, Northern Mariana Islands, Pitcairn Islands, Poland, Portugal, Romania, Russia, Réunion, Saint Barthéley, Saint Helena, Saint Martin, Saint Pierre and Miquelon, South Georgia and the South Sandwich Islands, Spain, Turks and Caicos Islands, U.S. Minor Outlying Islands, U.S. Virgin Islands, United States, Vanuatu, Wallis and Futuna, Croatia, Czech Republic, Greece, India, Indonesia, Latvia, Pakistan, Slovakia, and Ukraine. If you want more information, click on Bonus Terms at the bottom of the online casino or check out our Slots Million review here. If you are from a country excluded from Slots Million or don’t like the look of the site, there are plenty of alternative online casino websites with equally top-rated games and promotions. For players from United States, we highly recommend checking out Slots.lv, where you claim an exclusive sign up bonus offer on us upon your first deposit.